A beautiful pink flower coupled with delicately green leaves showcases the cover of a menopause supplement claiming to promote breast, heart and emotional health. Also among the claims of Promensil is its potential to maybe help with hot flashes, a common symptom of menopause. While some customers have stated negative comments towards this product, others have deemed it the greatest. Therefore, due to Promensil’s success, let us take a closer look at its components. When ordering Promensil from Amazon, customers are given the option of purchasing one of two packages. A 30 tablet package, equivalent to a 15-30 day supply, is priced at $14.21. Customers can also purchase 60 tablets (a 30-60 day supply) for $35.95. After researching this particular product, it is concluded that no guarantee accompanies any purchase. A company should always provide some form of a guarantee for their customers as this creates security for those skeptical about a purchase. Even though Promensil does assist in promoting a healthier body during the stages of menopause, there are still several inconveniences. First concerns the benefits. 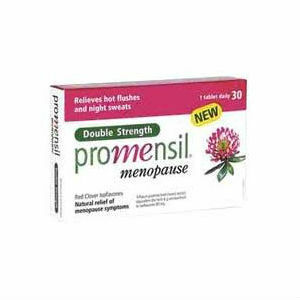 It raises slight suspicion that Promensil states that their product may help reduce hot flashes. This being a mainstream symptom of menopause, women are constantly looking for relief from it. If Promensil cannot guarantee this, it would be deemed wise to turn to other products. It is also a concern that Promensil does not address any other symptoms. If women cannot find the relief they so desire, other supplements will have to be introduced, thus increasing daily capsule intake. A second con concerns side effects. With all the symptoms associated with menopause, many women are not going to risk taking something that will only add to their discomfort. A final element of concern is the guarantee. Since Promensil offers no guarantee against void results, users are essentially risking their money on a product that may offer no relief. Jackie Horowitz	reviewed Promensil	on May 29th	 and gave it a rating of 2.